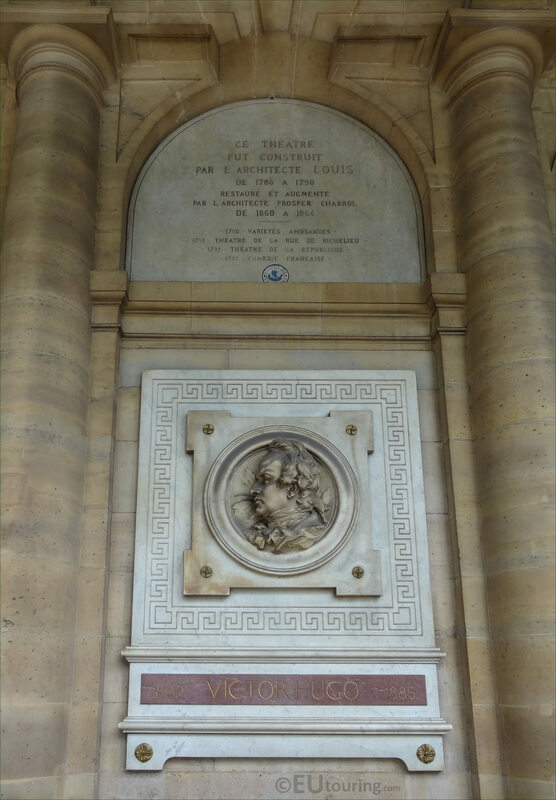 We were in the 1st Arrondissement of Paris at the Place Colette admiring the facade of the Comedie Francaise, when we took these high definition photos showing a medallion bust of Victor Hugo, which was sculpted by Denys Puech. 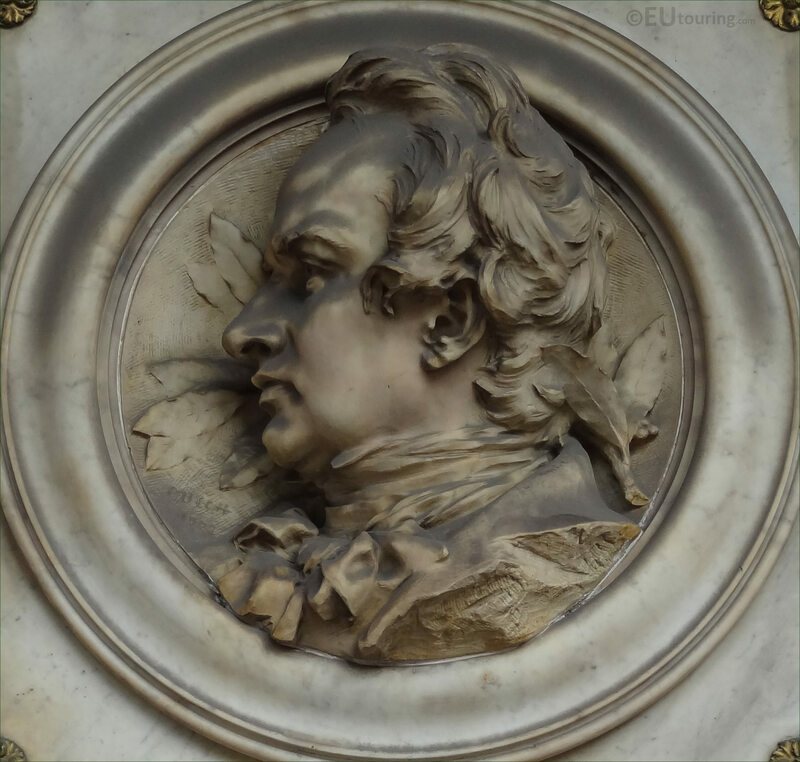 This first HD photo shows a medallion style bust depicting Victor Hugo, which was sculpted in marble in 1909 by Denys Puech and placed in an ornate surround on the facade of the Comedie Francaise, which is one of four that recognise renowned writers and famous French playwrights. Here you can see a close up photograph showing the bust of Victor Hugo who was born in February 1082 and became a poet, writer, novelist, dramatist and playwright, with famous works such as The Hunchback of Notre Dame and Les Miserables that have been translated into numerous different languages and are still enjoyed today. 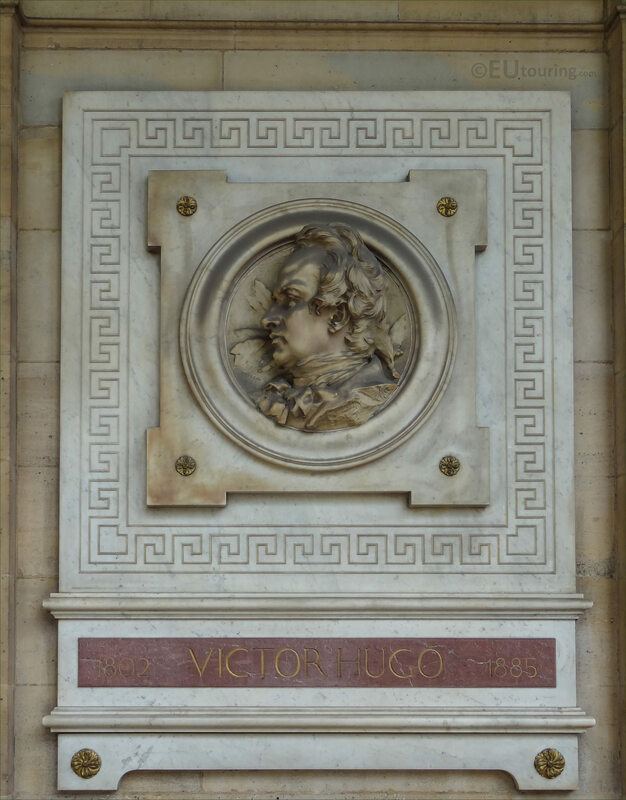 Victor Hugo became recognised as a national hero and over two million people turned out on the streets of Paris to watch the funeral procession from his home to his burial place within The Pantheon, and his works have inspired numerous musicians and composers, along with over a hundred operas and musicals, which has made Victor Hugo a household name, even after well over 100 years after passing away. 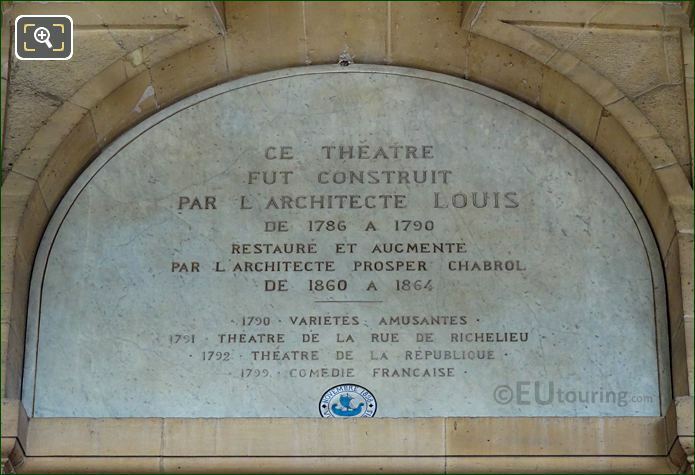 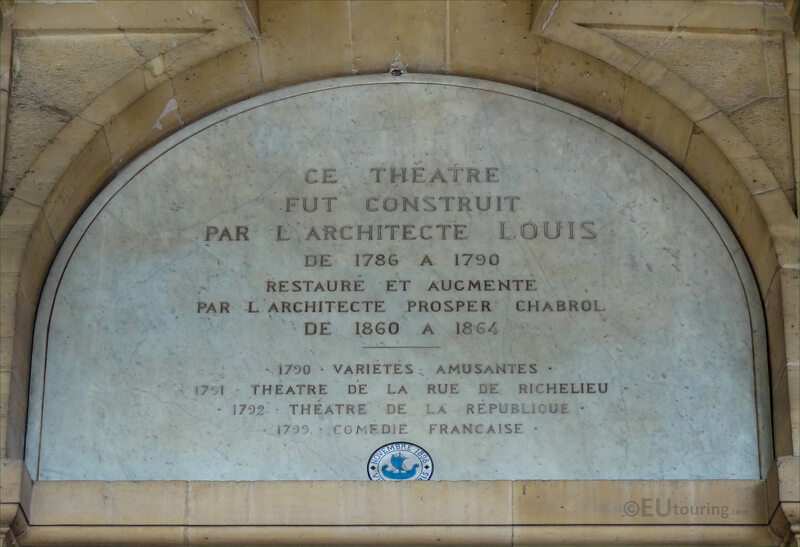 And as you can no doubt realise, the bottom part of the inscription provides the names that this theatre has been known as, but since 1799 has remained with the same name of Comedie Francaise. 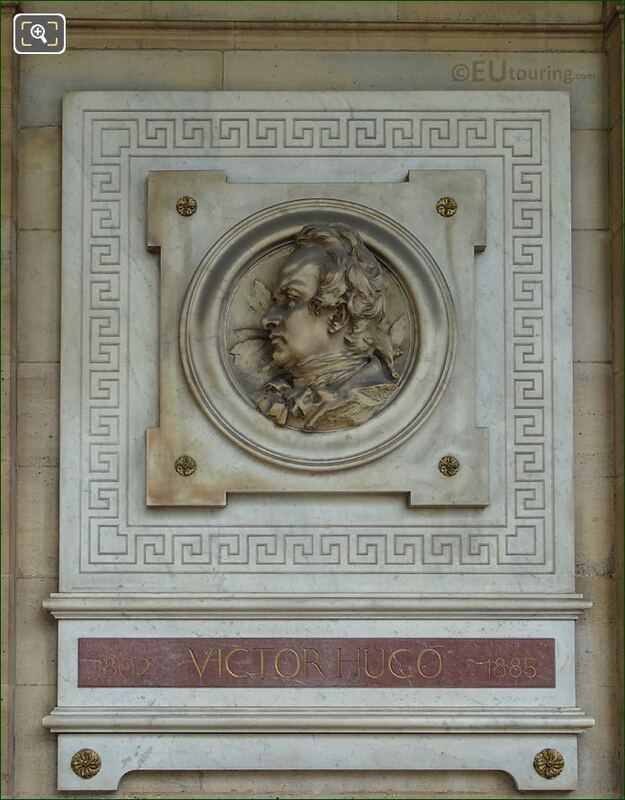 But as we mentioned earlier, the marble bust medallion of Victor Hugo was sculpted by Denys Puech, sometimes spelt Denis Puech, and born in 1854 he studied to become a French sculptor, winning the Prix de Rome in 1884, so he was able to spend time at the Villa Medici French Academy in Rome Italy furthering his studies. 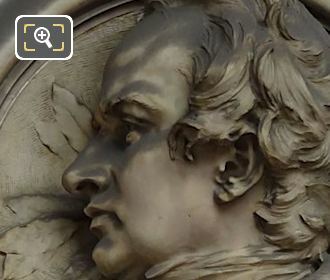 Having prolific career producing over 500 different statues and sculptures, he received numerous medals and awards, plus Denys Puech even became director of the Villa Medici for over ten years up until 1932, ten years before he passed away in his home region of Aveyron, where you can discover a museum that he founded and bears his name.